From ancient Greece to modern day Dubai, humankind has consistently tested the boundaries of art, physics, and function through architecture. EVERY YEAR, THOUSANDS FLOCK to major architectural landmarks around the world in appreciation of human engineering. We cross deserts to glimpse the pyramids. We climb mountains to set foot in Machu Picchu. 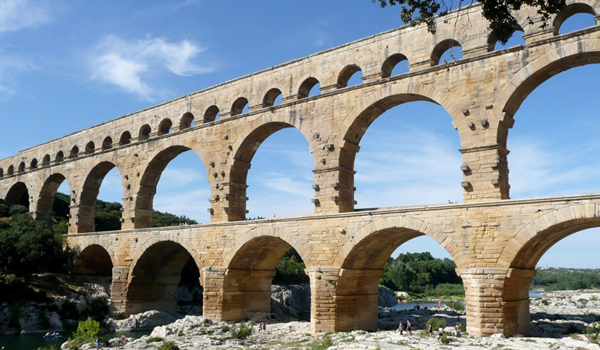 A structural wonder worthy of a pilgrimage exists on every continent. One of the world’s oldest cities, Athens is home to some of the most revered structures in the history of architecture. In creating the Classical Style, the Greeks established some of the founding principles for today’s buildings, guaranteeing their spot in every architectural textbook. 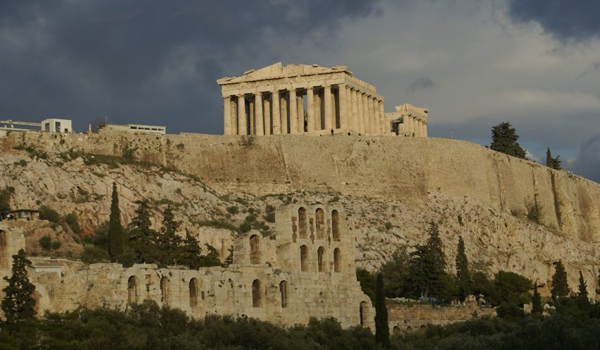 The Acropolis of Athens contains such incredible buildings as the Parthenon, the Temple of Athena, and the Erechtheum. The Acropolis / Photo by Charles P.
Who can forget the Romans? They invented the arch and the dome and perfected the use of concrete. Home to such heavy-hitters as the Colosseum, the Pantheon, the Pont du Gard, and the famous bathhouses, Rome is a formidable presence in architectural history and appreciation. No true student of architecture can willingly bypass the opportunity to witness mind-blowing Roman innovation. With thousands of years of history, China has paved the way for many artistic styles and expressions in the Eastern world. China has contributed historical and structural wonders such as the Great Wall of China, the Forbidden City, and Tianning Temple. 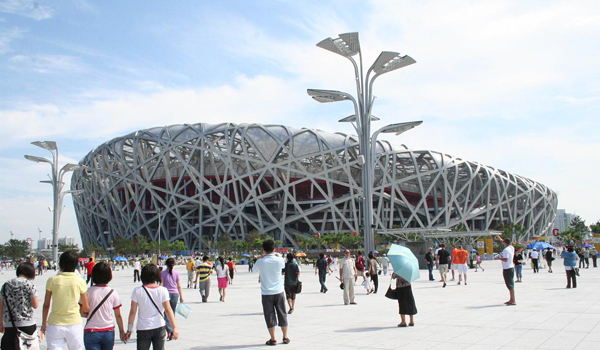 The recent construction of the Bejing National Stadium, also known as the “Bird’s Nest”, garnered worldwide attention not only for its modern design, but also for its hefty price tag. The Bird’s Nest / Photo by sHzaam! Hailed as one of the world’s most important business, financial, and cultural centers, London contains four of UNESCO’s World Heritage Sites (Tower of London, Westminster Abbey, Greenwich, and Kew Gardens) within city limits. In addition, this major global city hosted the Great Exhibition in 1851 in one of the most ambitious and talked about architectural structures at the time, the Crystal Palace. Although that building was subsequently destroyed in a fire, London still boasts of the preservation of architectural rock stars such as the Banqueting House, Nelson’s Column, the British Museum, St. Paul’s Cathedral, and the Gherkin. Arguably the most famous city in France, Paris is the site of such visitor favorites as the Eiffel Tower, Arc de Triomphe, Notre Dame Cathedral, and Sacre Couer. While there is no shortage of historically prominent architecture in Paris, modern structures have also been cultivating their reputation in the city of love. Architectural students and fans alike will not want to miss the Grande Arch, as well as I.M. Pei’s glass pyramid in the Louvre. A city near and dear to the heart of popular culture, Tokyo endured two devastating catastrophes in the 20th century that destroyed half the city. Consequently, much of the architecture in the greater Tokyo area is stylistically modern. Notable buildings include Fuji TV headquarters on O’Daiba, the Imperial Palace, and the chipper red and white Tokyo Tower. Fans of Kenzo Tange already know of the Yoyogi National Gymnasium with its suspension roof design and curvilinear lines reminiscent of Le Corbusier’s Ronchamp. For those interested in traditional Japanese architecture, the famous temple city of Kamakura is only a quick train ride south. 7. New York, New York, U.S.A. Though most of its architecture has only been erected within the last few hundred years, many of architecture’s leading designers have enthusiastically left their print on the city that never sleeps. From Mies van der Rohe’s and Philip Johnson’s functionalist Seagram Building to Frank Lloyd Wright’s winding Guggenheim Museum, New York has much to offer the student of modern architecture. And let’s not forget Gregory Johnson’s formidable Empire State Building. The second-largest metropolis in India, Delhi serves as a beautiful example of the juxtaposition of traditional Indian architectural styles with modern international styles. In Delhi, visitors may observe the zenith of Mughal creativity in the Red Fort. The fort’s Islamic domes and minarets are characteristic of traditional Indian architecture. Recently, the Akshardham Hindu temple complex was opened to the public, showcasing intricate, carved decoration reminiscent of the ancient stupas. 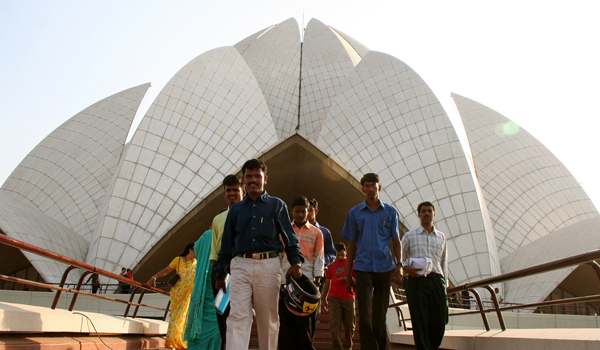 The Lotus Temple, a house of worship stylistically anchored in modernity, provides a stunning visual complement to the Sydney Opera House. The Taj Majal is also just a quick train ride away. Moscow is an architectural force to be reckoned with. From the universally recognizable onion domes of St. Basil’s Cathedral to the constructivist lattice webbing of the Shukhov Tower, Moscow showcases a variety of architectural styles. It was during Soviet times that Moscow received its most fervent revamping as Stalin aimed to bring modernity to the city through architecture. Since then, there has been heavy criticism concerning the destruction of Moscow’s historical buildings and revived efforts to preserve those still standing. Only really gaining the world’s attention within the last few decades, Dubai has quickly established itself as a powerhouse of construction and luxury. Although its architecture can’t rival Rome’s or China’s in historical value, Dubai is a fascinating junction of engineering and artistic design. 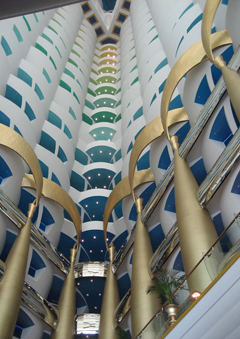 Tom Wright’s Burj Al Arab was constructed atop one of Dubai’s many man-made islands; its claim to fame is not just its sharp, modern aesthetic, but also its complex engineering feat. If the ubiquity of its image means anything today, Burj Al Arab stands as one of the most memorable structures of the latter 20th century. Interested in learning more about architecture? Why not use Craig Martin’s DIY Study Abroad Guide to plan travels in one of these cities? Take a peek at Tokyo through the looking glass to see if studying there’s your thing.